China, EUDONORGAN involving the 28 EU member states with a teaching methodology accessible through the phone and applicable to healthcare professionals and the civil society and Seeding Life with Northern European countries. I think it is equally important to underline our scientific perspective and we want to maintain our growth and interest. For this reason, we have been present in many congresses and published abstracts, books and articles that we summarize in this report. Our social community is a new item we are presenting, DTI community, with the aim to better reach our former trainees, establish a few ambassadors that will represent us around the world and manage a group of active volunteers that support our Foundation. We must not forget we are an NGO and our mission is to save lives, even from home. We have many challenges left for 2018: quality, volunteering, research, dissemination, digitalization, and other tools to refine in the coming future. We are witnessing a greater demand for increasing donation worldwide. The fight against organ trafficking from organizations like the Council of Europe, the Pontifical Academy of Sciences, multiple scientific societies, WHO and the UN, triggers the interest in developing organ donation, and our Foundation is at the core of the necessary services to make it possible at a global level. We hope to do it well. DTI Foundation is a non-profit foundation formed by a group of recognized international experts in donation and transplantation. DTI Foundation offers consultancy and training for the implementation of courses and projects in the field of donation and transplantation of organs, tissues and cells. Through our education program TPMÂŽ, more than 14.000 healthcare professionals from 100 countries have been trained since 1991. Furthermore,DTI Foundation cooperates at international level with the SEUSA program, which represents the best of 3 models of donation efficient systems of organs, tissues and cells for transplantation. Our mission is to advise and support international public and private entities involved in the health care system to design, develop and strengthen networks, programs, services and/or research projects in the field of donation and transplantation of organs, tissues and cells. Our commitment is to raise organ donation rates worldwide, to improve the quality of life of the society and to support regenerative medicine. 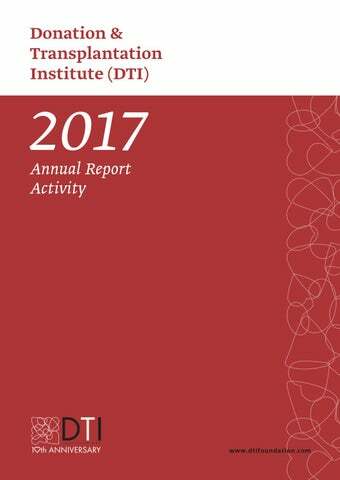 This report contains a summary of the most important activities held in 2017. 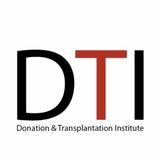 TPM TRAINING DTI Foundation considers that training for healthcare professionals involved in the donation and transplantation field has proven to be of extreme importance for the improvement and increase of organ donation and transplantation activity worldwide. «The course increased a lot my experience about how to manage the system of transplant coordination and how to make it successful learning from the best organization as TPM of Barcelona.» Workshop for nurses. Barcelona, September 2017. TPM TRAINING During 2017, TPM has implemented 19 courses in advanced and intermediate modalities and a workshop. Abu Dhabi, UAE. Intermediate course. Buenos Aires, Argentina. Intermediate course. In May 2017, 67 healthcare professionals from the Shanghai province attended the 3rd International Course in TPM, with the collaboration and the support of the World Health Organization, the China Organ Donation Management Center, the China Organ Transplantation Development Foundation and other hospitals and institutions. In August, eight TPM-DTI international experts from USA, Hong Kong, Iran, Brazil and Spain travelled to Kunming for the 2nd edition of TPM Advanced Course. 50 participants from ICU, Emergency and Direction departments attended the course and learnt from each other experiences. Their motivation led to a successful course. In September 2017, the third Edition of the Intermediate Training course in Transplant Procurement Management took place in the city of Nanning. 51 participants from different hospitals in the area were granted a TPM diploma. After three days of course development, they showed high interest in the lecturers and active participation in the practical simulations. The knowledge and experience the experts shared intended to motivate the participants to be more involved in the organ donation field, to improve their daily clinical practice in their own units, and to show a significant impact in terms of numbers of organs available for transplantation. 3rd International Training Course in Transplant Procurement Management. Shanghai. 3rd Intermediate Training Course in TPM. Nanning. The 303 Military Hospital of Nanning and DTI Foundation are engaged in a cooperation partnership since 2017, aiming at improving the organ donation activity, to facilitate the exchange of experience and expertise, and to develop scientific research in the field of organ donation and transplantation. The Guangxi OPO (ODAC) is one of the centres with an important activity in organ donation and transplantation, presenting a high donation rate among Chinese provinces. During the year 2017, as a result of this partnership, several actions of knowledge exchange, assessing the donation activity in the local hospitals and presenting the research results to the international scientific community, have been completed. In September 2017, experts from DTI visited tres hospitals of the ODAC Network: Guigang People´s Hospital, the First People’s Hospital of Yulin, and the Second People’s Hospital of Pignan City. A report with measures and recommendations for improvement was delivered and an action plan has been designed. Following these visits, the 3rd Intermediate Training Course in Transplant Procurement Management was held in Nanning. In addition, a total of eight professionals have participated in preceptorship visits in Barcelona and Madrid. The Hospital 12 Octubre of Madrid hosted a physician working at ODAC for a 4-week internship. Moreover, the ODAC team has presented three oral presentations at the International Society for Organ Donation and Procurement (ISODP) congress in Geneva. DTI is very pleased to collaborate with the Nanning team and happy to inform that further actions are planned for 2018. DTI experts visit to healthcare facilities in Nanning. The collaboration with Kunming dated few years ago and since then, several actions and courses have been done. This year, the cooperation has reached a higher level, and together with the Kunming OPO, DTI set the basis of a SEUSA program aiming at improving the structure and results of the donation and transplantation program. The expertise from Dr. Tom Mone from USA, Dr. Reginaldo Boni from Brazil, and Dr. José María Domínguez from Spain, will be used to design and implement a customized model for Kunming. Tools and clinical practice from the three countries’ successful models will be adapted and shaped to the KMOPO characteristics. We are very enthusiastic about working in Kunming and to share our experience with Dr. Chao Li, the director of the KMOPO and dear friend of DTI Foundation. Meeting with KMOPO and DTI experts for the SEUSA program. Kunming. SEUSA is a colaborative program to ensure self-sufficient transplant systems. It is based on a comprehensive model that combines the best practices of the Spanish, European and USA models. Within the framework of the collaboration programs between DTI Foundation and the China Organ Transplantation Development Foundation (COTDF), in November was organized the fourth edition of this international cooperation initiative, when a team composed by 10 healthcare professionals visited Spain. The aim of these visits is to offer the Chinese doctors the possibility to obtain firsthand knowledge of the everyday practice of donation and transplantation programs in hospitals from Barcelona and Madrid, and to understand the organizational aspects of the system by visiting Catalan Transplant Organization (OCATT) and National Organization of Transplantation (ONT). This visit is combined with the participation of these professionals at the Advanced International Training Course in Transplant Procurement Management in Barcelona. Preceptorship of Chinese healthcare professionals at a Spanish hospital. Madrid. A team of six experts from the Transplantation Center of the 3rd Xiangya Hospital, Central South University in Changsha, China, travelled to Spain for a deeper learning about the Donation and Transplantation programs in Spain and Europe. During this period, the team led by Prof. Ming Yingzi visited several Hospitals in Barcelona and Madrid, the National Transplant Organization (ONT), and the Catalan Transplant Organization (OCATT). The delegation also met with the key opinion leaders of the donation and transplantation programs. The aim of the visit was that the delegation members transfer the acquired knowledge into their everyday clinical practice and therefore improve the donation and transplantation program in their center. Visit of Changsha delegation at the Hospital ClĂ­nic. Barcelona. BLENDED PROGRAMS & POSTGRADUATE DIPLOMAS DTI offers 4 different blended and postgraduate programs: Organ Procurement, Organ Transplantation, Leadership, Quality and Management in Organ Donation and Transplantation; and Tissue Banking and Advanced Therapies. Each blended program includes on-line and face-to-face training and it is accredited with a diploma of 10 ECTS. The Postgraduate diploma consists of a blended course plus 2 weeks of hospital internship in associated centres in Spain, USA and other countries and it is worth 15 ECTS. DTI offers 4 different blended and postgraduate programs. The educational offer has been designed to enable any student to follow an academic curriculum that may end up with the Master degree. To obtain the International Master in Donation and Transplantation of Organs, Tissues and Cells the student must complete 30 ECTS corresponding to blended training, 15 ECTS corresponding to 6 weeks of internship and Final Master Dissertation (15 ECTS). ORGAN TRANSPLANTATION • Immunology basics & Immunosuppression • Infections • Malignancies • Organ specific: kidney, liver, pancreas, heart, lung • Living donation transplant Modalities: online, blended and postgraduate. Modalities: online, blended & postgraduate. TISSUE BANKING AND ADVANCED THERAPIES • Tissue donor detection • Eye, cardiovascular, muscoleskeletal, skin, stem cells and cord blood banking • Tissue processing • Ethical and regulatory issues • Quality management • Advanced therapies Modalities: online, face-to-face, blended and postgraduate. LEADERSHIP, QUALITY AND MANAGEMENT IN ORGAN DONATION AND TRANSPLANTATION • Best practice models • Management & leadership • Teambuilding & empowerment • Quality programs, quality indicators, standards and auditing in organ donation and transplantation • Incorporating skills into practice Modalities: blended or postgraduate. (Bottom left) Tissue Banking and Advanced Therapies. Practical simulations. (Bottom right) Master class by Dr.Manyalich. The Master in Clinical Investigation (60 ECTS) is an official Master that offers eight different modalities including the specialty of donation and transplantation of organs, tissues and cells. This master is addressed to students who want to follow a PhD program in this field. It is designed to provide the students with knowledge and skills necessary to develop a scientific activity of donation and transplantation process at any step. The 2016-17 edition of the professional program ended with 18 participants from 15 different countries and the research program had 14 participants from 7 different countries. You can find more information about the Master and postgraduate programs in www.tpm-master.org. We continue to work towards improving organ donation so that transplant systems are efficient and adapted to the requirements, needs and demands of the centers, regions or countries throughout the world. In 2016 a new initiative to make possible deceased donation in Ethiopia started. Several actions have been conducted, with great motivation from the Ethiopian partners, DTI, and the support from University of Michigan. In January 2017, a team composed by international experts in deceased donation programs visited the facilities of St Paul’s hospital and Addis Ababa Trauma and Burn Center (AABeT). Furthermore, important meetings with the hospital directors and Saint Paul’s Millennium College took place. In addition, this initiative, as well as the projects on living kidney transplantation and the basis for deceased donation were presented to the Minister of Health of Ethiopia; Professor Yifru Berhan Mitke. Ethiopia. International expert visit to Saint Paul’s Hospital in Addis Ababa. Since the agreement for a two-year transplant partnership with the Organ Transplant Services of the South Philippines Medical center in Davao City; University of Barcelona and Hospital Clinic; under the auspice of the International Society of Nephrology-The Transplantation Society (ISN-TTS), this alliance has opened a window for other collaboration opportunities between the partners. Philippines. Visit from DTI expert delegation in Davao City. DTI Foundation is collaborating with the Saudi Center for Organ Transplantation (SCOT) in a project sponsored by the Ministry of Health of KSA (Kingdom of Saudi Arabia). This 3-year program aims at implementing a quality management system to increase the deceased donation rate. Saudi Arabia. Visit to the Deputy Minister of Health to plan the project aims. Within the framework of this project, an in-situ diagnosis study visit was organized this year in KSA led by Dr. Martí Manyalich (DTI president), Dr. José Luis Escalante (project director), Dr. Francesco Procaccio (ICU expert), Mr. Estephan Arredondo (project coordinator) and supported by SCOT experts and representatives. This visit included meetings at the SCOT, the Ministry of Health of KSA, and different hospitals in the cities of Riyadh and Jeddah to analyze the global situation of the country in terms of organ donation. Therefore, areas of improvement and recommendations were detected and presented in a report to the Ministry of Health. This collaboration; started on 2010 and supported by the REPSOL Foundation, is one of the challenges of the Trinidad National Organ Transplant Unit (NOTU), the Pan American Health Organization (PAHO) and of DTI Foundation. The main goal of the project is to establish the self-sufficiency in the deceased donation program and make Trinidad and Tobago a reference country in the field for the CARICOM region. Trinidad and Tobago. Granted student from Trinidad and Tobago during her Master dissertation defense at University of Barcelona. DTI Foundation visited Goa (India) in July 2017 within the framework of the Kidney Update 2017, organized by the Indian Medical Association. Our executive director Dr. María Paula Gomez has participated in the conference. Taking inspiration from Spain, the aim of the event has been promoting the idea of an effective organ donation and transplant system. TPM-DTI Foundation is actively involved in different European initiatives which support the development and implementation of specialized training programs in organ donation all around the world. Seeding Life (2016-2017), Erasmus+ project, has been a twolevel training initiative that aims to improve professional competences, knowledge and skills in organ donation and transplantation in Bulgaria and Latvia. The project boosted best practice exchange between Spain, as one of the best models worldwide in organ donation, and two East European countries with similar experience in the field (Bulgaria and Latvia). Seeding Life. Train the trainers face-to-face course Sofia, Bulgaria. The training program was completed by 26 future trainers, ICU physicians and surgeons, and considered a blended learning methodology (online and face to face). The local trainers returned to their centres and organized 16 national seminars (10 in Bulgaria and 6 in Latvia), reaching out more than 620 professionals in the two countries, almost double than initially foreseen (375 healthcare professionals). The project generated high interest and further possibilities of collaboration are explored. Seeding Life. Final meeting in Riga, Letonia. Erasmus+. Program coordinators with volunteers. The Erasmus Program “European Voluntary Service (EVS)” correspoding to the year 2017 was closed in last December. In this edition the DTI Foundation has counted with the participation of two volunteers coming from Hungary and Ukraine, who have developped during nine months the project “Training Program in Organ and Tissue Donation” with a widely satisfactory result for the Foundation as well as for both participants. Eudonorgan is a project awarded by the European Commission on the initiative of the European Parliament, it is led by the University of Barcelona and supported by the Donation and Transplantation Institute (DTI), the Institute for Organ and Tissue Transplantation of the Republic of Slovenija, The Institute for Transplantation and Biomedicine - Ministry of Health of the Republic of Croatia, the Italian National Transplant Centre (CNT) and Dinamia (Spain). Its main aim is to develop and implement two types of activities at EU level, focusing on training and improving social awareness to enhance the positive attitude towards organ donation, and ultimately help improving donation rates. New innovative tools have been created for training and awareness purposes with multilingual programming and different degrees of difficulty. Training amounted to 100 study hours, employed a blended learning methodology highly scored, and was completed by 101 beneficiaries from 28 European countries, out of which 79 were healthcare workers (medical doctors, nurses and medical students) and 22 were non-healthcare professionals (patients and patients’ representatives, journalists, communication experts, representatives of health care establishments, ministries or Competent Authorities). Eudonorgan. Meeting with competent authorities. Now, 6 social awareness events are being prepared throughout Europe. For more information visit www.eudonorgan.eu. KeTLOD. Training course in Barcelona. The KeTLOD project (Knowledge Transfer and Leadership in Organ Donation) from Europe to China is co-funded by the Erasmus+ Programme of the European Union. The project consortium includes the University of Barcelona (UB), Spain, as coordinator; together with Donation and Transplantation Institute (DTI), Spain; Dinamia S. COOP. MAD (DINAMIA), Spain; The University of Nice - Sophia Antipolis (UNS), France; and Alma Mater Studiorum Universita di Bologna (UNIBO), Italy. It aims at setting up a tailored Postgraduate Training Program on Organ Donation in 7 Chinese universities from different areas of China. In this regard, a diagnosis study has been carried out in the 7 beneficiary Chinese universities following different adapted questionnaires on: “Donation activity”, “Existing trainings & Specific training needs” and “Online feasibility &University requirements”. Based on the needs identified a two-level educational initiative was designed. The first educational level consisted in the Training for Trainers of which 22 Chinese future trainers benefitted. Together with them 144 Chinese participants were selected for the second educational level: Postgraduate Program on Organ Donation, currently in progress. For more information visit www.ketlod.cn. KeTLOD. Networking agreement signature. IRODAT is the International Registry in Organ Donation and Transplantation with data registered since 1998. All the data are open for free consultation in www.irodat.org, which received over 100.000 visits in 2017. Subscribe to newsletter! Search and obtainment of human tissue for research Promoting the donation of tissue banks and regenerative therapies around the world. Development and cooperation projects With the aim of improving organ donation and transplantation at an international level through consulting services. In addition to the congresses publications, DTI Foundation has participated in the writing of book chapters and has published articles in scientific journals. Specialized training for health professionals since 1991 Training for professionals in organ and tissue donation and transplantation. Online, face-toface and blended courses, and masterâ&#x20AC;&#x2122;s degree. Publicizing the activities of the foundation As well as discussing current issues in the field and underlining the value of training healthcare professionals from the leading Spanish model. A display with information about organ donation and transplant activity was presented in ESOT Congress 2017 in Barcelona. During the congress the campaign team interviewed distinguished professionals from the field of organ donation and transplantation, such as the president of the ESOT, Dr. Stefan Schneeberger, among others. The campaign increase awareness about the importance of organ donation for transplantation in Spain. This exhibition is now on a 10-week tour through transplant hospitals in different regions of Spain. The official inauguration of the campaign took place on the 16th of October in the 12 de Octubre Hospital located in Madrid. During 2017 the project has been presented in the following hospitals: 12 de Octubre Hospital (Madrid), San Carlos Clinical Hospital (Madrid) and University Hospital of A CoruĂąa (Galicia). 12 de Octubre Hospital, Madrid. 16-20 October. San Carlos Clinical Hospital, Madrid. 23-27 October. University Hospital of A CoruĂąa, Galicia. 11-15 December. The campaign has also started the production of a documentary film which will include some of the interviews held in transplant hospitals. This documentary will include emotional stories of organ donation and transplanted patients, health care professionals and donorâ&#x20AC;&#x2122;s families. During 2017, 92 doctors and 15 transplanted patients and family members were interviewed as part of the campaign. 650 people have already shared their simle. Join the campaign and share your smile with the world! The production company responsible for the display design and the documentary film is Daristoteles. Moreover, Transplanting Smiles is a campaign sponsored by Chiesi Spain. During the year 2017 650 people have already shared their smile. Join the campaign and share your smile with the world! On the website www.trasplantandosonrisas. org or through your social networks with the hashtag #trasplantandosonrisas. DTI Community New international community of people and institutions whose purpose is to share knowledge of organ donation and transplantation. This Community looks forward to engaging and connecting the TPM alumni and anyone who is involved and interested in organ donation. The DTI Community has different types of membership: alumni, friend, volunteer and ambassador.